Discover out-of-the-way places like Wine Tours & Tastings and Bom Jesus do Monte. Explore the numerous day-trip ideas around Porto: Santuario de Santa Luzia (in Viana do Castelo) and Centro Historico de Guimaraes (in Guimaraes). There's much more to do: snap pictures at Ponte de Dom Luis I, contemplate the long history of Porto Cathedral (Se Catedral), pause for some photo ops at Monumento aos Herois da Guerra Peninsular, and look for gifts at Mon Pere. Plan my day in Porto using traveler tips and tourist information provided by Inspirock. Teresina, Brazil to Porto is an approximately 12.5-hour flight. You can also do a combination of flight and train. The time zone difference moving from Brasilia Time (BRT) to Western European Time (WET) is 3 hours. Traveling from Teresina in August, expect nights in Porto to be a bit cooler, around 17°C, while days are much colder, around 28°C. Finish your sightseeing early on the 18th (Sun) so you can take a train to Coimbra. On the 19th (Mon), take in the architecture and design of University of Coimbra, stroll through Praia Fluvial de Vimieiro, then admire the striking features of Torre da Universidade de Coimbra, and finally get lost in a book at Biblioteca Joanina - Universidade de Coimbra. On the 20th (Tue), you'll have a packed day of sightseeing: don't miss a visit to Miradouro De Penacova, enjoy the sand and surf at Praia do Reconquinho, then see the interesting displays at Museu Nacional de Machado de Castro, and finally make a trip to Praca Oito de Maio. To see where to stay, more things to do, ratings, and other tourist information, refer to the Coimbra tour itinerary planner . You can take a train from Porto to Coimbra in an hour. Other options are to drive; or take a bus. August in Coimbra sees daily highs of 30°C and lows of 18°C at night. Finish your sightseeing early on the 20th (Tue) to allow enough time to drive to Nazare. Nazaré is a town and a municipality in subregion Oeste and Leiria District, in Portugal.It is one of the most popular seaside resorts in the Silver Coast/Costa de Prata, Portugal. 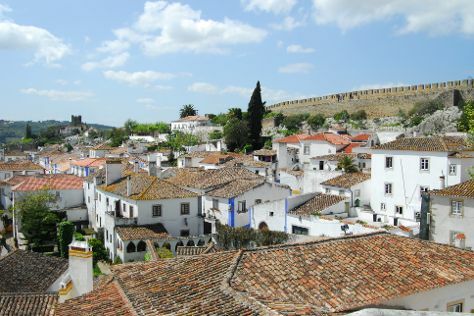 Discover out-of-the-way places like Obidos Village and Praia da Nazare. Change things up with these side-trips from Nazare: Batalha Monastery (in Batalha), Tomar (Pegoes Aqueduct, Castelo de Tomar, & more) and Shrine of our Lady of the Rosary of Fatima (in Fatima). The adventure continues: take in the spiritual surroundings of Monastery of Alcobaca, explore the historical opulence of Castelo de Óbidos, and don't miss a visit to Forte de Sao Miguel. For reviews, maps, more things to do, and tourist information, read our Nazare travel app . You can drive from Coimbra to Nazare in 1.5 hours. Other options are to take a bus; or take a train. Expect a daytime high around 30°C in August, and nighttime lows around 18°C. Finish your sightseeing early on the 23rd (Fri) so you can drive to Lisbon. You'll discover tucked-away gems like Cabo da Roca and Vasco da Gama Bridge. Get out of town with these interesting Lisbon side-trips: Guincho Beach (in Cascais) and Sintra (Initiation Well at Quinta da Regaleira, Quinta da Regaleira, & more). There's still lots to do: admire nature's wide array of creatures at Lisbon Oceanarium, don't miss a visit to Bertrand Books And Music, pause for some photo ops at Padrao dos Descobrimentos, and wander the streets of Belém Tower. To see other places to visit, traveler tips, and other tourist information, read Lisbon sightseeing app . Drive from Nazare to Lisbon in 1.5 hours. Alternatively, you can take a bus; or take a train. While traveling from Nazare, expect somewhat warmer days and about the same nights in Lisbon, ranging from highs of 35°C to lows of 20°C. On the 28th (Wed), wrap the sightseeing up by early afternoon so you can travel back home.